Did Vice Ganda just confirm past romance with Terrence Romeo at his concert? Vice Ganda gave hints about having an extremely difficult relationship with someone who called him ‘Juliet’. Vice Ganda turned emotional after finishing his eight-minute spoken word piece at his fifth major solo concert titled Pusuan mo si Vice Ganda sa Araneta Nagmahal, Nasaktan, Nag concert! at the Big Dome. Vice’s sold-out Valentine’s concert, which was attended by over 12,000 people, was divided into three parts: Nagmahal, Nasaktan, and Nagmove-on. Aside from having performances with his guests including Maja Salvador, Awra, Daryl Ong, Michael Pangilinan, Kris Lawrence, and Daniel Padilla, one part of his concert had him doing a spoken word piece. The piece discussed Vice’s former romance with a certain basketball player with whom he didn’t have any chance to spend time with publicly due to fear of being judged. While he has asked “permission” from the management about the things that he would be discussing at his concert, Vice said nobody had an idea what the content of his spoken word poetry was going to be. “Kasi nung sinabi ko hindi ko pa kumpleto ang tula, hindi ko pa natatapos,” he explained about the piece which he wrote himself. Vice was formerly associated with cager Terrence Romeo, but the latter has denied any ties with the former. 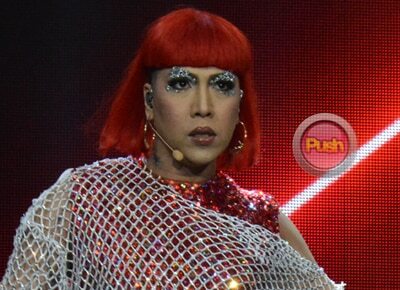 Despite talking about his ex, Vice confirmed that his new flame came to watch his show. Apart from his spoken word poetry, another portion that truly got many laughing was his dance showdown with his “anak” Awra. “Eh siyempre ‘yung anak ko hindi naman papakabog ‘yun. Kapag sinimplehan ‘yung production number ayaw niya. Sabi niya ‘Parang mas maganda ‘yung ginawa natin sa Parental Guardians? Kailangan mas kabog,’” he explained. “Kaya kahit manganib ang buhay niya, ako tuloy ang natatakot,” he continued. According to Vice, he initially didn’t want Awra to take on some of the death-defying stunts that they did onstage. “Ayoko nga nung huli eh, ‘yung itatapon kaming dalawa. Sabi niya ‘Sige na, kaya naman natin.’ Siya gustong gusto niya talaga,” Vice said. Vice revealed that he is slated to bring his sold-out concert to the US by end of March. “Pusuan Mo si Vice Ganda sa Amerika. Nagmahal, Nasaktan, Nag-Concert is happening in Orlando, Florida on March 25, Houston, Texas on March 26, San Diego on March 31 and in Los Angeles, California by April 1.